(12.11.2012) In 2005, Ethiopia concluded an agreement with the Dutch company HPFI, sharing itsteff genetic resources in return for a part of the benefits that would be achieved from developingteff products for the European market. In the end, Ethiopia received practically no benefits. Instead, due to a broad patent and a questionable bankruptcy, it lost its right to utilize and reap benefits from its own teff genetic resources in the countries where the patent is valid. The amazing story of the Teff Agreement has been uncovered and meticulously documented in a recent FNI report by FNI researchers Regine Andersen and Tone Winge. Teff is a food grain endemic to the Ethiopian highlands, where it has been cultivated for several thousand years. Rich in nutritional value, it is an important staple crop for Ethiopians. Since it is gluten-free, it is also interesting for markets in other parts of the world. 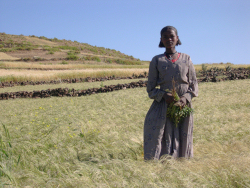 A 2005 agreement between Ethiopia and the Dutch company HPFI gave HPFI access to 12 Ethiopian teff varieties, which it was to use for developing newteff-based products for the European market. In return, the company was to share substantial benefits with Ethiopia. The Teff Agreement was hailed as one of the most advanced of its time. It was seen as a pilot case for the implementation of the Convention on Biological Diversity (CBD) in terms of access to and benefit-sharing from the use of genetic resources (ABS). But the high expectations were never met: The only benefits Ethiopia ever received were 4000 Euro and a small, early interrupted research project. And then, in 2009, the company went bankrupt. In the years prior to bankruptcy, however, HPFI managed to obtain a broad patent on the processing of teff flour in Europe, covering ripe grain, as well as fine flour, dough, batter and non-traditional teff products. This patent, along with other values of the company, had then been transferred to new companies set up by the same owners. These companies now possess the exclusive rights to a large range of teff-based products. But as it was the now bankrupt HPFI that was Ethiopia’s contract partner, these new companies are not bound by the contractual obligations of HPFI towards Ethiopia. Ethiopia thus ended up receiving practically none of the benefits promised under the agreement, and its future opportunities to profit from teff in international markets were smaller than before. This is what FNI researchers Regine Andersen andTone Winge have been looking into in their new reportThe Access and Benefit-Sharing Agreement on Teff Genetic Resources: Facts and Lessons, published by FNI today. Their report has been written as part of FNI’s contribution to the German-led ABS Capacity Development Initiative, focusing on mainly African experiences with access to and benefit-sharing from the use of their genetic resources. Under the current circumstances, even the very best ABS agreement is without value if there is no willingness to comply with it: As long as there are no measures in place in the user-countries (in the teff case: The Netherlands) such agreements can be seen as gentlemen’s agreements, requiring a basis of good faith. Provider countries (in the teff case: Ethiopia) need institutional and financial support to enable them to monitor ABS agreements, and to facilitate real access to justice in the user countries. A multilateral instrument for this purpose under the CBD combined with user-country legislation is probably the most realistic possibility to realize the objectives on fair and equitable benefit-sharing of the CBD and its Nagoya Protocol. Formulations in ABS agreements prohibiting the patenting of genetic resources may be easy to circumvent, and more sophisticated formulations should be chosen if this is to be avoided. © 2012 – 2013, Prof. Muse Tegegne. All rights reserved.